Welcome to the Summerfield swimming pool! 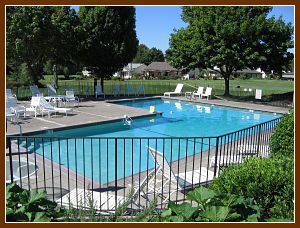 Our beautiful outdoor pool is open from around Mother’s Day weekend through the beginning of October. There are plenty of chaise lounges, tables and chairs for your enjoyment. Our residents can enjoy the swimming pool at all hours, with the exception of Tuesday mornings from 7 AM – 9 AM when it is closed for routine maintenance. Children under the age of 18 are welcome each day from 11 AM – 1 PM and again from 6:00 PM – 7:30 PM with the adult resident. The following rules are provided by the Summerfield Swimming Pool Committee. Observance of these rules will assure all pool users a safe and pleasant experience. The swimming pool area is a non-smoking facility. NO LIFEGUARD IS ON DUTY!!!!! Dressing rooms and pool gates are kept locked at all times and can be opened with your clubhouse fob. Guests must be accompanied by a Summerfield Civic Association member at all times. Each member is required to sign in at pool house and indicate the number of guests. The maximum number of guests in the pool area at any one time is 4 per household. Host member must accompany guests and is responsible for their conduct and safety. Members and adult guests may use the pool at any time. Youth guests (under 18 years of age) may use the pool only during the following hours: 11:00 AM to 1:00 PM and 6:00 – 7:30 PM. Youth guests are expected to be respectful of all others using the pool area or they will be asked to leave. Oregon State Law requires safety ropes during youth swim hours. Anyone playing on the ropes will be asked to leave. Safety devices that are worn by the swimmer are acceptable. Diving is not allowed at all in this pool!! It is not safe in this pool. All persons should take a cleansing shower before entering the pool. Chairs and lounges should be covered with a robe or towel when lotion or oil is used. Residences younger than 55 must carry their SCA membership card and be prepared to show it if asked, otherwise they may be asked to leave. The pool is NOT available for private parties. The pool is closed for maintenance Tuesday mornings from 7:00 am to 9:00 am. No one may be in the pool during that time.